﻿ Magazine content за Август 2015 г.
Maria Suspitsyna Does the Copyright Holder Misuse His Right to Trademark if He Does not Use It? Provisional list of documentary evidence in Section 1 of Article 71 of the Civil Procedure Code of the Russian Federation mentions trial records. However, specific features of this type of documentary evidence has not been investigated in proper detail in scholar works on civil procedure. A trial record should mirror what happened in court room. In particular, it includes essential evidential information. Sometimes, a seemingly insignificant detail of the trial included in the record could influence the perception of the judgment. In certain cases such records led to changes in current legislation. The article draws attention to some problems of judicial practice related to the estimation of trial records. It proposes certain changes to civil procedure to improve rules about trial records. The article focuses on usability of the dynamic concept of civil process for the development of the Unified Civil Procedure Code. According to this concept, the Supreme Court of the Russian Federation should be entitled to issue procedural regulations on the basis and in furtherance of legislative provisions; the general provisions on procedural acts should be included to the new Civil Procedure Code as a separate chapter; professional qualification requirements to those who represent clients in courts should be introduced; the access to qualified legal advice and assistance should be guaranteed to everybody regardless of his or her financial standing; templates of judicial documents should be used more widely and practices of their implementation should be improved. The article analyses the regime of joint and separate consideration of claims arising from relationships governed by private law (civil proceedings) and public law (administrative proceedings). It is commonly known that after the Code of Administrative Procedure of the Russian Federation becomes effective the courts of general jurisdiction should apply differentiated procedure for the consideration of claims arising from administrative and civil relations; the first ones are considered according to the rules of the Code of Administrative Procedure of the Russian Federation and the second ones — according to the rules of the Civil Procedure Code of the Russian Federation. At the same time, joint consideration of disputes arising out of civil law and public law claims is still allowed in arbitrazh courts by their procedural rules. This article discusses possible negative effects that occur when parties use general civil procedure and procedure for administrative disputes jointly and successively. It is argued that sometimes joint use of these two types of procedure could be beneficial and should be allowed. This could help avoid unjustified delays in protection of rights and eliminates the risk that two controversial judgments could be issued in different types of procedure. In general, this change would be instrumental in ensuring that the case is considered timely and resolved correctly. 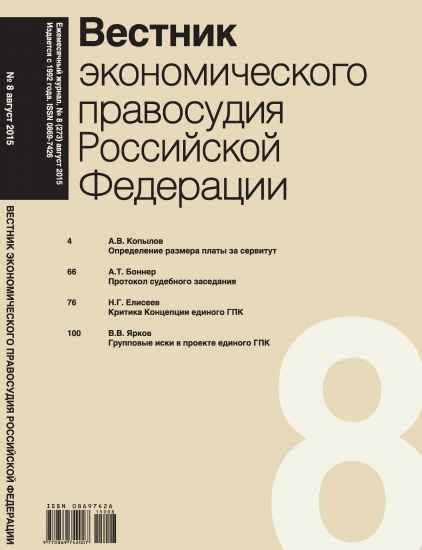 The article considers a possible edition of the chapter on class action in the project of the Unified Code of Civil Procedure of the Russian Federation. The author suggests a common model for class action to be used not only in arbitrazh but also in civil process. The suggestions made in the article are based on both positive and negative experience of application of Chapter 28.2 of the Arbitrazh Procedure Code of the Russian Federation as well as author’s interpretation of class action according to its legal nature, which does not correspond to the traditions of the civil law countries. One of the main ideas suggested by the article is that the concept of unified legal relation should not be used as a means of shaping the class. Instead, one should use for this purpose the criterion of the uniformity of subject matter and grounds of the action brought by the members of the class. The article considers the issues of legal regulation of the submission of new procedural material by parties in appellate court and suggests how these issues should be resolved in civil (arbitrazh) procedure. It is argued that the appellate court should exclude not only new evidence (as it should do according to the current legislation) but also any other procedural material, such as new claim of fact, negation, confutation. Procedural material should be regarded as new if it is first presented (disclosed) in the appellate court. It is submitted that new procedural material should be admitted by the appellate court only in the following cases: (1) if it relates to the matters that the court of first instance considered as not significant for the resolution of the dispute while the appellate court thinks otherwise; (2) if it was not presented (disclosed) in the first instance due to a procedural mistake; (3) if the party which presents (discloses) it was not negligent in not doing so in the first instance; (4) if it is aimed to refute procedural material that was first presented (disclosed) by the other party in the appellate court and was admitted by this court. This year the Supreme Court of the Russian Federation has proposed two draft laws to the State Duma aimed to develop simplified proceedings. One of them suggests the introduction of the court order as a form of judgment for arbitrazh courts. The other draft law describes simplified case resolution procedure by courts of general jurisdiction. The article characterizes main provisions of the draft laws as well as grounds for their proposal. The author traces the development of simplified case resolution forms in the Russian law beginning from civil procedure of the Russian Empire and shows connection between the proposals of the Supreme Court of Russian Federation and earlier regulation.